Hi! My name if Betty Blackwell and I am a "Real Okie" from Muskogee!! I was born here, attended Whittier Elementary School, Alice Robertson Junior High and graduated from Muskogee Central High School in the class of 1968. GO ROUGHERS! I earned my Bachelor and Masters degrees in Education from Northeastern State University in Tahlequah. My career in education was spent at Hilldale Elementary School, Muskogee, as both a teacher and counselor. In 2003, it was time for something new. I started my career as a REALTOR with RE/MAX of Muskogee. I am a member of the Greater Tulsa Association of REALTORS, Oklahoma Association of REALTORS, National Association of REALTORS and have the designation of Certified Residential Specialist. With RE/MAX, I am among the Top 5 Individuals in Oklahoma, a member of the Platinum Club and Hall of Fame. 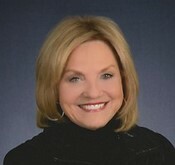 I am licensed in the state of Oklahoma and can sell you any property for sale regardless of who the listing agent is. Outside of Real Estate, I am a member of the Exchange Club that sponsors the Chili Cookoff and River Rumba that benefits numerous children's charities in Muskogee. I also belong to the Rotary Club and the Muskogee Chamber of Commerce. I attend First Baptist Church where I am a member of the choir. But what I am most proud of are my three daughters and four grandchildren!